The King County Academy of Family Physicians (“KCAFP”) is a professional medical society dedicated to maintaining high standards of family medicine. Our mission is to advance and support Family Physicians in King County in providing optimal health care to all people. The vision of KCAFP is to transform health care to achieve optimal health for all people. To that end, KCAFP encourages members to submit funding requests to support our mission. The projects funded by KCAFP are the full responsibility of the recipient member. 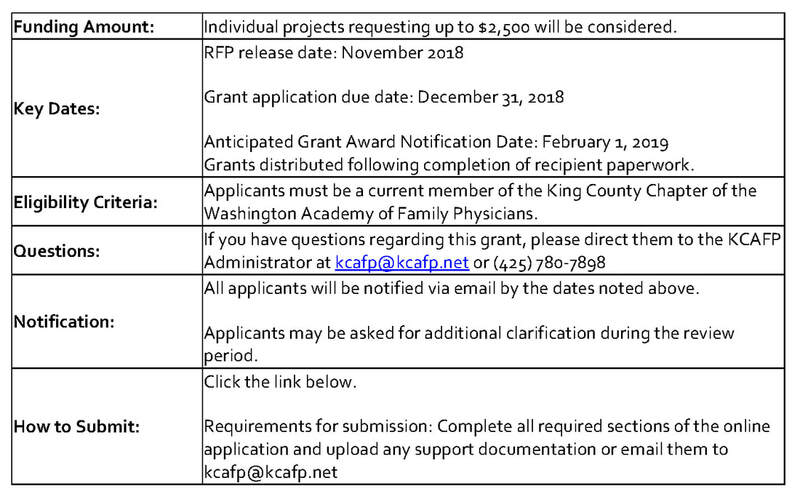 KCAFP has no influence over any aspect of the projects and only asks for reports about the results and the impact of the projects in order to share them publicly.